One of the big myths of Christian growth and church growth result from spectacular manifestations or major breakthroughs. 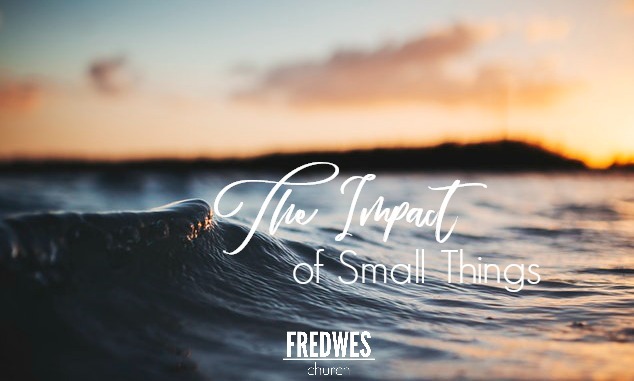 Many of us tend to overlook the importance and the impact of small things, especially small things done consistently over time. Remember the Challenger disaster? The official conclusion on the cause of that tragedy was the failure of a few small and inexpensive "o" rings. Just a couple of little things but one big failure. I'm sure you recall the Columbia space shuttle tragedy. It was caused by a few missing tiles from the heat shield designed to protect the craft from the intense heat during re-entry to the earth's atmosphere. Again, small tiles but huge impact. It would be hard to completely assess the impact the automobile has had on the modern American lifestyle. But Henry Ford, to whom we owe a great deal, made one small mistake in the design of his first Model-T - he forgot to build reverse into it. Correcting that seemingly minor error launched the ever-expanding love affair between Americans and their cars. Those are just three examples of small things that made huge, even historic differences. So, why would spiritual growth be different? Should you sit around waiting for big things to happen? It that how it happens? Is that what you should expect? Or should you run around to gospel concerts and attend charismatic conferences until you experience and amazing breakthrough? Is that how it happens? Not usually. It almost always happens one small victory at a time. A new discipline like starting a prayer journal, or finding a prayer partner can make a big difference. A new commitment to a ministry or conquering a negative attitude show significant growth. When you replace a bad habit with a good behavior, that's real growth. And the result of winning those little daily battles is often that big breakthrough others are chasing! What is the growth point in your life right now? What little victory could you win that would make the biggest difference? When will you stop wishing and start winning? When the Psalmist identifies God as a Shepherd He is, at the same time, implying that we are sheep. In fact, He is and we are. You don't have to know much about sheep to know you wouldn't want to be one. Sheep are dumb, dirty, and defenseless. The fate of a sheep depends upon his shepherd. If he has a good shepherd the future is his friend. If not, his future is not so bright. The 23rd Psalm is an amazing Psalm. It is the favorite of many many people. This Psalm is a sheep bragging about his shepherd. And it begins with the words, "The Lord is my Shepherd." In the Hebrew it is "Jehovah-Rohi." The Eternal God is my shepherd. He is our guide. He leads us. He feeds us. He comforts us. No other name of God carries the tenderness and intimacy of "Jehovah-Rohi". When we need to be reminded that the Lord is taking care of us, we can come to the 23rd Psalm and praise Him as "Jehovah-Rohi". The second part of that verse should be translated, "I shall not have needs." Actually, you're wants aren't even discussed here, except in the translators' choice of words. The whole point is that taking care of our needs is God's responsibility. That's His job. He's volunteering for it. He's good at it. We need to let God do His job without needless harassment. Herein is the inspiring point of this Psalm. If you are a sheep, and you are. And if a sheep is only as good as its shepherd, and he is. And if the Lord is your shepherd, which He is. Then you are one blessed sheep! And as long as you keep following "Jehovah-Rohi", your future is your friend!